It’s August and time to look at the still standing and the wilted. There is no use in growing things that you have to coddle when you want to enjoy your outdoor spaces from indoors. Here are some of the winners from my 2012 summer hot season. To be fair, I have not experienced the dry conditions, let alone the drought, that much of the country has gone through. The rains have helped keep the sprinkler system off and the water bills low. 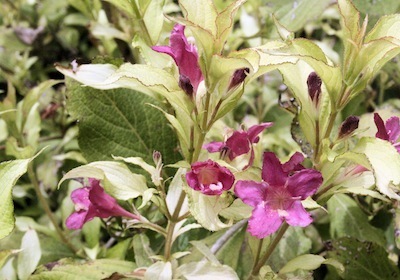 Weigela Ghost® was sent to me several years ago from Proven Winners as a trial plant. I have to say I love it. It has withstood the reflected heat of the concrete driveway with only a smattering of brown on its leaves. And that, only after I cut it back to expose inner leaves. 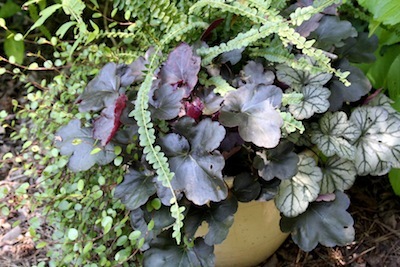 Not only is the foliage an attractive blend of lime, cream, and green, edged in red, but also it reblooms with red deep-throated flowers several times throughout the spring and summer. Hummingbirds also love it. Ghost® also grows a lot taller than I expected. I have cut it back twice this year so that we can see out of the driveway. Even so, it is blooming now, even after the indignity of pruning. It is hardy to USDA Zone 4. Crape Myrtles, like Bradford Pears, are a mainstay Southern street tree. Unlike the Bradford pears, they get better as they get older. 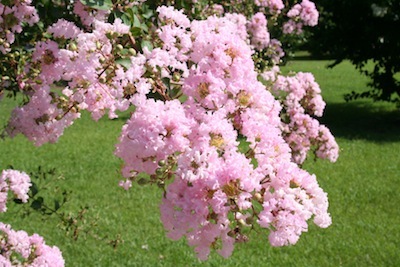 Crape myrtles’ biggest problem is the homeowner with loppers, who thinks the trees need pruning into stumps atop a main stem. This system of pruning, called pollarding, should be left in English manor gardens. (Here we call it Crape Murder.) This not only creates weak growth at the top, but also restricts the aging of the beautiful exfoliating bark, which is part of a crape myrtle’s garden charm in all seasons. Lagerstroemia indica and its hybrids are hardy to USDA Zone 7, with Lagerstroemia fauriei hardy to USDA Zone 6. Madagascar Periwinkle Catharanthus roseus, is also known as vinca or just periwinkle. There are some beautiful hybrid colors out there but I have just been growing the common white. In fact, this year I had plenty of self sown seedlings establish, so this is a real favorite: No planting involved and flowers all summer. In the middle of the day, it might roll its leaves just a bit to conserve moisture and the flowers might droop a little, but never has it looked sad. A casual observer would probably never notice. 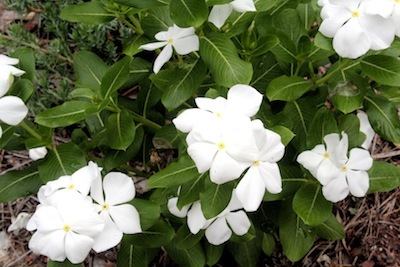 Vinca/periwinkle is usually available in the spring as a 6-pack bedding plant or you can easily grow it from seed. Not surprisingly, the succulents are thriving in the heat, as are the tropical plants summering outdoors. The bananas and elephant ears are huge, but that’s because they didn’t lack rain. I have trimmed the sun coleus a couple times. Their exuberant growth was taking over the containers. Venture out and make notes to see what is still looking good in your garden. Next year’s survivors begin with this year’s notes.